The Bad Effects Of Coffee – Should You Quit? Looking into the bad effects of coffee might be enough to persuade some individuals to give up the beverage, or not to start drinking it in the first place. One of the culprits involved, the one we hear most about, is caffeine. Caffeine is at the root of most of the problems coffee can cause, but there are a couple of other things to consider as well. Those who rely on the morning cup of coffee to get the day off to a good start will strongly defend its good points, and the same can be said for those who like to sit and linger over a second cup of coffee. Caffeine Allergy - Probably the most serious of any of the bad effects of coffee is caffeine allergy. Fortunately, this condition is not terribly common, and most of those who do have an allergy to caffeine either are not aware of it, or the symptoms aren't particularly serious. 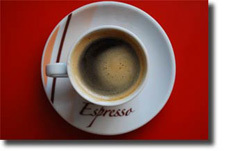 Other foods, such as chocolate and colas, also contain caffeine, but coffee more often than not the source of most problems due to a caffeine allergy. Symptoms include itching, irritability, and muscle pain. Toxicity - Too much caffeine, too much coffee if you will, can be toxic. One would normally have to drink quite a bit of coffee to experience caffeine toxicity, but some do drink many cups in the course of a day. The symptoms are similar to caffeine allergy, but the problem here isn't one of being allergic, but ingesting having too much of something. In either case, a person so afflicted could be jittery and tense and in some instances difficult to be around. We all know that coffee, being a stimulant, tends to make us alert and keep us awake, but too much can make a person tense and hyperactive. The Nutrition Factor - If you are drinking too much of something, you might not be drinking enough of something else. In spite of the fact that most of what makes up that good cup of coffee is water, coffee is nevertheless a diuretic. If your body isn't getting enough water, drinking coffee usually isn't going to help the situation. Add to this the fact that coffee is not a particularly nutritious beverage. You would probably be better off substituting water or fruit juice for some of the coffee you drink, if you are drinking several cups a day. Designer Coffee - Then there is the matter of cost. Coffee brewed at home is not more expensive than most other beverages we drink, cheaper than most in fact. When we become addicted to the specialty coffee-based beverages, espresso, café-mocha, and the like, and are spending $4 or so every day to get our coffee "fix", it can over time be hard on the budget. That would not seem to have much of an effect on our health and well-being, but if you're on a tight budget and shelling out $100 or so a month for your daily designer cup of coffee, it can lead to a stressful situation. Not the good kind of stress either. The arguments supporting the bad effects of coffee can be summarized as having an allergic reaction to caffeine, caffeine toxicity from ingesting too much, becoming high-strung, nervous or having problems sleeping, and relying on a beverage that does little for us in terms of nutrition. The cost factor can then be thrown in to try to bolster the argument. Enjoy - The fact is, coffee does not have an ill effect on most people, and most people don't drink enough of it to cause problems in any event. The enjoyment a good cup off coffee provides in pleasant surroundings, or even in not so pleasant surroundings, is a powerful argument that there really aren't all that many bad effects of coffee. If you drink lots of coffee every day, it might not hurt to cut back a little. But if coffee doesn't seem to be causing any particular problems, by all means continue to enjoy a cup or two every morning. One of the things we were taught when young, was not to drink coffee, as it would stunt our growth. Many of us followed that advice, and ended up on the short side anyhow.